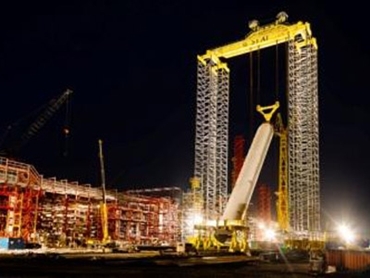 Enerpac (A Division of Actuant Corp) presents a new self-erecting tower lift system that enables users to build a freestanding hydraulic strand jacking gantry from ground level up to a height of 80 metres with a lifting capacity up to 1600 tonnes. The globally transportable ESET series from Enerpac Integrated Solutions (IS) incorporates proven technologies widely deployed internationally, including Enerpac hydraulic strand jacks used for heavy and complex lifting, shifting and positioning projects. The tower lift system is engineered to significantly reduce transportation and set up costs compared with large cranes. The ESET can be packed into containers for applications throughout industries such as oil and gas, mining and energy, materials handling and ports, and construction and infrastructure. Examples include pressure vessels, processing towers, refinery reactors, mineral processing and distribution plants, oil and gas FPSO offshore modules, reactors, communition mills and large plant and port facility construction. The ESET tower lift system incorporates a unique self-erecting mast system and the gantry is installed on skid tracks, distributing the footprint load for optimum stability. Strand jacks are used to position the gantry system longitudinally. To lift the load, the ESET uses a pair of Enerpac strand jacks, each with a capacity of 850 tonnes. Depending on the ESET configuration, two or four strand jacks can be used. The load can also be shifted sideways by a transverse skidding system, also operated by controlled hydraulic power packs. Safe management of the ESET is optimised by two advanced PC-Control systems. The primary system, managing the mast lifts from each corner, controls a precision lift rate averaging three metres per hour within a synchronous tolerance of less than 3mm. The second system is Enerpac’s proven Smart Cylinder Control (SCC) control system, which is standard on all strand jack systems and synchronises the motion of the strand jacks. All power packs and control systems can be powered by a single 100kW generator. Installation of the ESET series is straightforward with four lift containers positioned at ground level, one for each mast. An automatic hydraulic lifting mechanism inside each container lifts the mast barrels in increments of 900mm. Octagonal profile mast barrels made from S690Q steel precision fabricated by robotic technology maintain stringent quality, strength and dimensional requirements. Mast stability is achieved by a sophisticated high-strength lightweight bracing system installed once the barrels are extracted above the lift container level. Mr Richard Verhoeff, who is Integrated Solutions Manager for Enerpac in Australasia comments that the ESET can be supplied in various capacities and heights and built with standard modular components, enabling a flexible solution to future project demands. The new ESET is part of the technology range of Enerpac Integrated Solutions, which is dedicated to lifting, shifting and manoeuvring some of the world’s heaviest and most challenging objects and structures. IS technologies include PLC and SCC (Smart Cylinder Control)-controlled synchronous lifting systems, while allow a single operator to control operations such as multi-cylinder lifts, and weighing and determination of the centre of gravity of heavy objects.